During the bleakest days of the financial crisis, it seemed the economy would never bounce back. Credit was seizing, business stopped producing, people were losing jobs, and the Dow was dropping by 700 points a day. But six years later, not only has the darkness passed, but the economy has actually flourished. 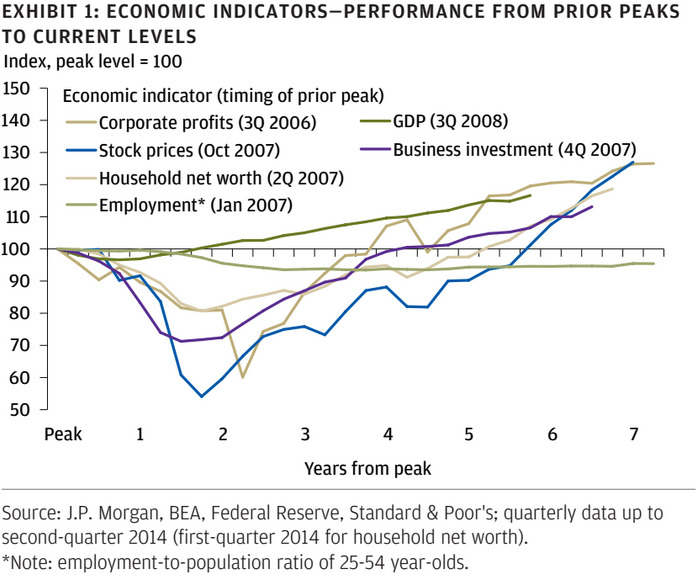 In a new research note, JPMorgan Research analysts chart six economic indicators from before the financial crisis to today — and things are looking good. Five out of the six indicators (corporate profits, stock prices, household net worth, GDP, and business investment) have not only reached their pre-crisis highs, but they have actually surpassed them. “Since the bottom of the economic cycle in June 2009, the US economy has expanded by 20.7% with new highs in economic output and corporate profit margins,” according to the report. And on top of all that, M&A activity is back to 2007 peaks, and capital expenditures have grown by 58% over the past five years. 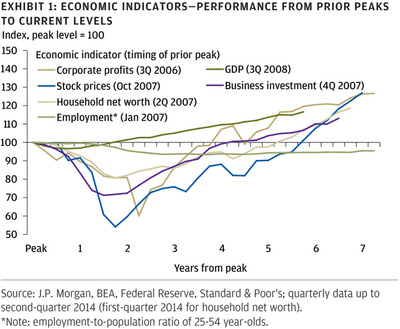 The only indicator that has yet to fully rebound is employment (as measured by the employment-to-population ratio). We still haven’t reached the January 2007 high.